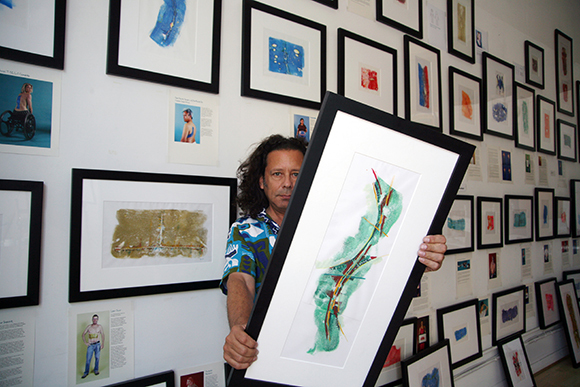 Ted Meyer is a Los Angeles-based artist, curator, and patient advocate who has been coloring the lives of those with traumatic injuries for 17 years with his project called "Scarred for Life: Mono-prints of Human Scars." "The whole idea is to tell their story by making a beautiful piece of art from their scar" Meyer said. 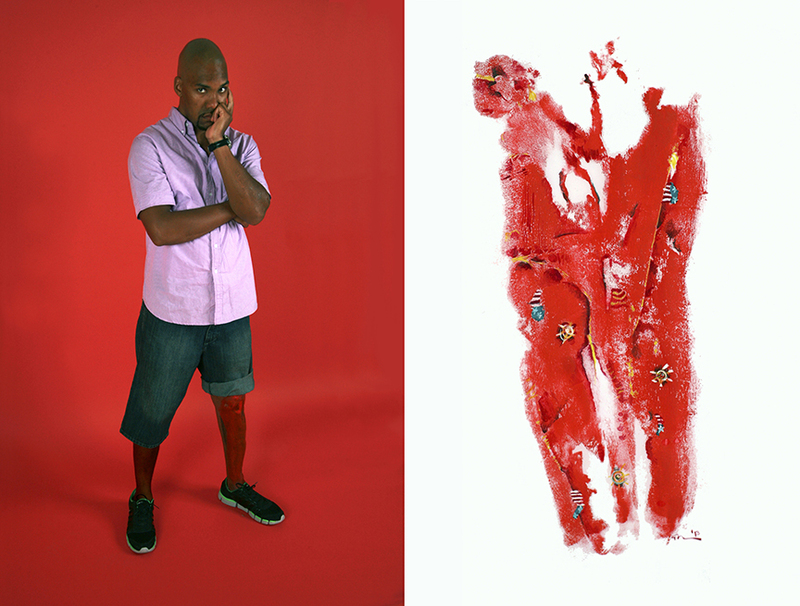 "I do a print off their body and then I try to work in some of the details of what happened to them into the painting that I do over the print." Meyer is comfortable around hospitals because he was born with an enzyme deficiency that doctors believed would cut his life short. Fortunately, a treatment was found, and the breakthrough radically changed his life and artistic focus. "I met a woman who was using a wheelchair with a broken back," he recalled. "We had a long conversation one day and she told me I should keep doing my art because I still had a lot to say about it." He called the woman to do a print of her scars, and the public's reaction to the artwork received was very different from that received by his paintings. 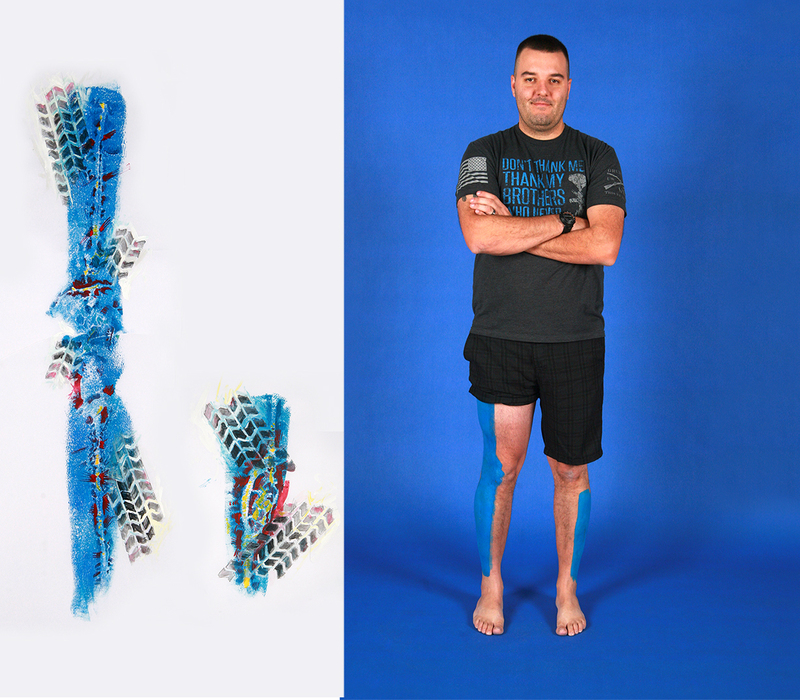 "People would come up to me after seeing the work and show me their scars," Meyer said. "They take their shirt off, pull down their pants or lift up a dress, everybody wanted to tell me. That was seventeen years ago and I've been doing this since." Originally, Meyer shied away from printing veterans' wounds. Though he comes from a family with military tradition, he didn't feel he had the credentials to do it. "I'm not in that world," he said. "There's a couple of other veteran projects and usually they have a much closer relationship to it than I do." That all changed a few years ago. Someone close to Meyer returned from Iraq after several tours as a helicopter pilot and killed himself. "I thought I should approach this subject by letting people tell their stories, because he never told any of us that he was struggling," Meyer said. "Apparently, he had some damage in his jaw from shrapnel, and they wouldn't let him fly because the jaw was deteriorating." So Meyer decided to tell veteran stories, but that has created a different problem: He needs more veterans to become works of art. He was offered an exhibit at the National Museum of Health and Medicine, but he couldn't find enough scarred vets to participate so he had to postpone the show indefinitely. "I think it was very systemic of the fact that a very small percentage of people fight over there," Meyer said. "It's a different culture and these are people who have a different sense of what being patriotic and being an American and defending us is." One of Meyers' subjects, Jerral Hancock, is missing an arm, is paralyzed, and burned. "Almost his whole body is scarred from burns," Meyer said. "He had a lot of texture, so I went in and I have his tank that he had been in sort of marching across, rolling across his scar. I try to give it a narrative, but also make it a beautiful piece of artwork." 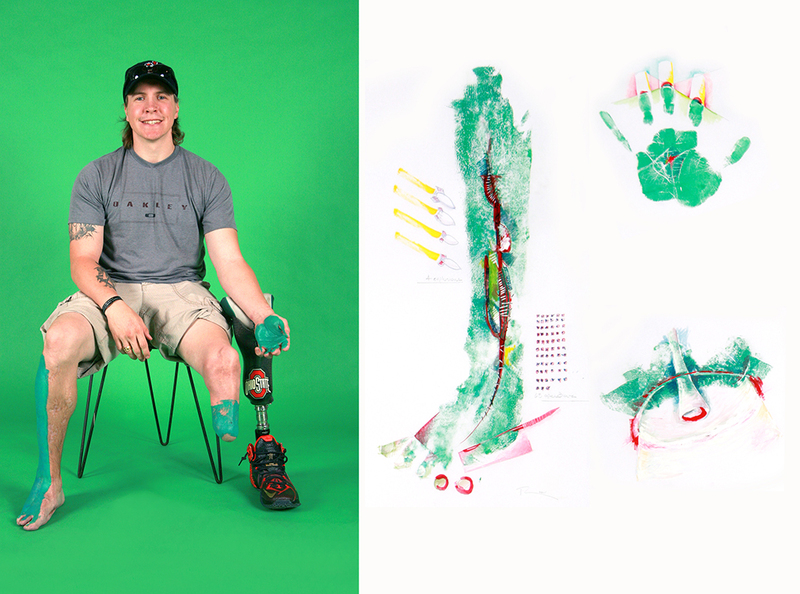 "It was cool seeing war and our scars put to art, and it was an interesting experience going through Ted's art," Hancock said. "I would recommend it to other vets because it helps show the reality of war for those who don't understand the sacrifices made." Working with wounded warriors changed the way Meyer sees the veteran community. A man who spent his life with people in physical and emotional crisis gained an appreciation for a new group he's never known and relates that experience to the world. "They've given a tremendous amount and don't feel bitter about it," Meyers said. "There's a moral integrity to that I find lacking most everywhere else." Meyer has an upcoming show for his "Scarred for Life" project at Muzeumm Gallery in Los Angeles from February 6th through March 1st. 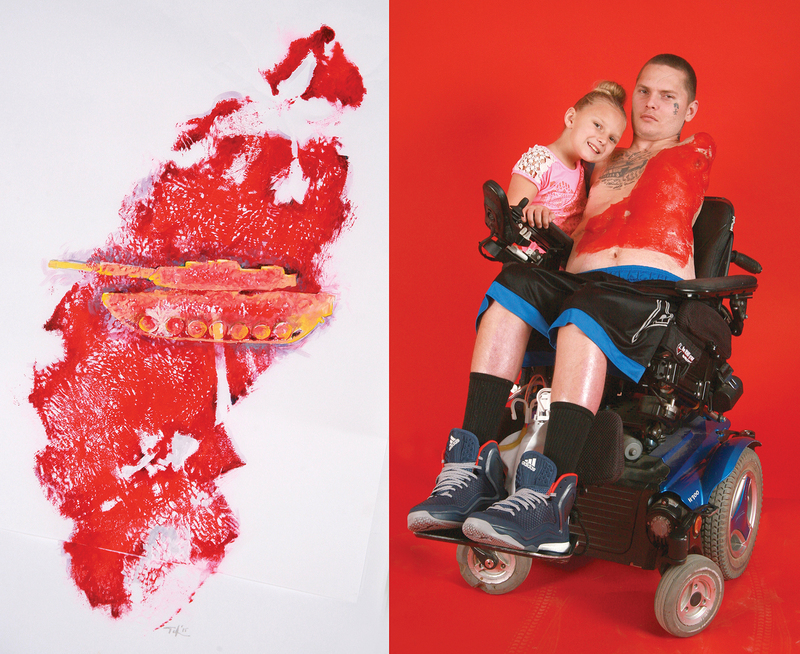 If you're a veteran with scars and a story you'd like turned into art, contact Ted Meyer at ted@artyourworld.com.